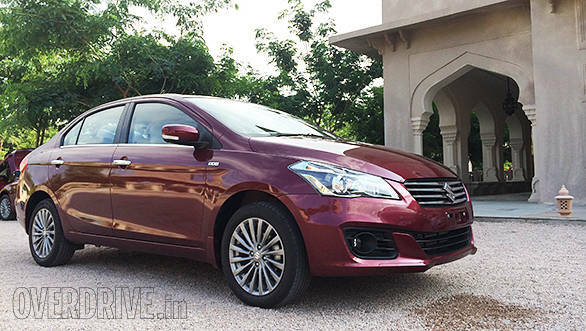 Maruti Suzuki's successor to the SX4,the Ciaz has now been launched at Rs 6.99 lakh (ex-Delhi). There are six variants available in petrol, while the diesel engine is only offered in four trims. The base trim, that is the V, gets projector headlamps, front and rear armrests, keyless entry, audio system with USB and AUX-in system. Fabric upholstery and electrically adjustable wing mirrors are also part of this package. Next in line is the V+, priced at Rs 7.55 lakh (ex-showroom Delhi)  the additional features in this trim include driver airbags, ABS and EBD along with climate controls, parking sensors, Bluetooth connectivity, an adjustable driver seat and steering mounted audio and telephone controls. The petrol engine offered is the the 1.4-litre K-Series petrol, while the 1.3-litre MultiJet powers all the diesel variants.